NOVEMBER 6, 2013:Issimo's Veronica Ridge writes:'Alphabet City Melbourne is a unique children's book highlights Melbourne's diverse architectural design....' read on! OCTOBER 10,2013: Jan and David, (the Pomeranz and Stratton of Melbourne radio!) from 3CR's PUBLISHED OR NOT Books Program interview Maree Coote about the brand new edition of The Melbourne book, and other recent and upcoming titles by Maree. (What a privilege to enjoy a full half hour chat with this duo! -MC). "Listen up Melbourne parents! I think I have found the perfect book for you. I was at a first birthday party on the weekend and one of the stand out presents was Maree Coote's 'Alphabet City Melbourne' (Board Book).....The kids loved it and even a few of the adults (me included) issued sqwarks of delight when we found a letter we recognised. What could be better?" 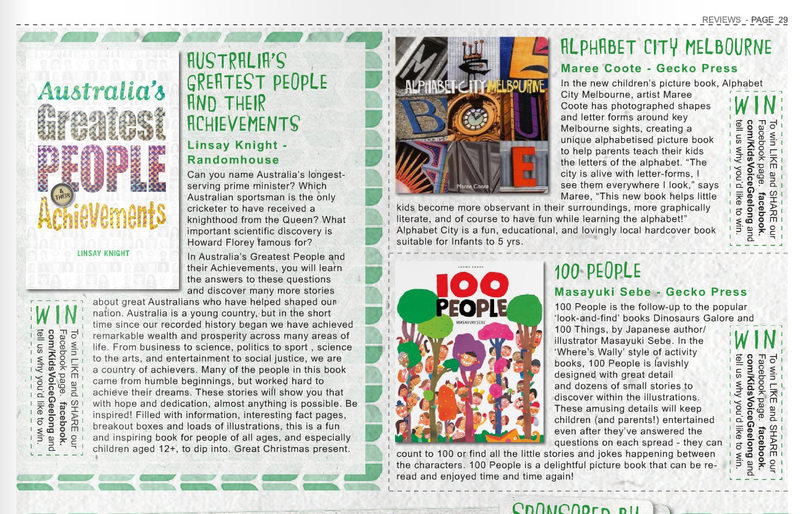 NOVEMBER 27, 2013: INTERVIEW::Kids Books Review<?span> interviews Maree Coote about Alphabet City Melbourne ... EXCERPT: "I try to get people to take up noticing, which I think is a dying pastime and fast losing favour with the e-distracted young. With their indoor lifestyles, prescribed entertainments, and with their heads stuck in screens and devices. At worst they'll get hit by a tram, at second worst they'll miss out completely on their own time and place. This is their city, their time, their place, and their story. They should own it." It's chunky and perfect for stacking high. Colourful open spreads will make the shop window look very enticing!